It was one of the great but infamous quotes after England had been eliminated from another World Cup. “We’ll have to look at the data” had a few mouths dropping but, sadly, and to spoil a good story, it wasn’t entirely accurate. Peter Moores, at the time the England head coach, had in fact used “it later” for the last two words. Authors Peter Miller and Dave Tickner are doubtless very keen to see England win the World Cup and they have produced a most interesting book about what has gone wrong since 1992. Lest we forget, England are yet to claim a World Cup trophy. Before 1992, they had reached two finals (1979 and 1987) and two semi-finals (1975 and 1983). Messrs Miller and Tickner start with 1992 when, indeed, another final was reached but, in their excellent and well-researched read, they offer many valid reasons why the trophy remains elusive. For armchair fans,it may be easy to forget that some World Cup campaigns have come after gruelling tours of Australia with the Ashes holding sway in the minds of the selectors. What is possibly not as readily appreciated is that ODIs always appeared to be the poor relation of Test cricket in the eyes of the national selectors. Test players were therefore more usually picked ahead of more blossoming and promising shorter-format players even whilst other countries more readily adapted their selections for all formats. When the eyes of the world were watching the shift in the way most countries approached limited over internationals, England were still persisting with the tried, tested but ultimately unsuccessful ways of years gone by. That said, there were good tournaments and these are fitted into the story. Adam Hollioake led a side of few stars who returned with a tournament win in Sharjah but his days with England and its captain were not destined to be as long as might have been expected. Teams prepare for four years ahead of a World Cup tournament. It has likely been unhelpful that last-minute changes – the removal of Alastair Cook as ODI captain just weeks before the 2015 competition being one example – have occurred before two tournaments. It is unlikely that England were seen as a steady side or contenders and this and very much more is discussed in detail by Peter Miller and Dave Tickner. 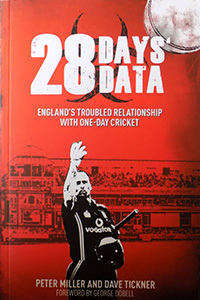 Calling upon many of the good and great of past England teams, the authors make 28 Days’ Data a most interesting book. There are signs now that England, under the new regime of Andrew Strauss, are embracing ODIs as seriously as they do Test cricket and the results are undoubtedly there to see. 28 Days’ Data is a compelling read and congratulations must be offered to Peter Miller and Dave Tickner.